Saudi Arabia access control market is expected to witness robust growth across all the verticals owing to increasing infrastructure investments for economic diversification. Additionally, Saudi Arabia access control market is driven by growing security concerns due to increasing terrorist threats, safety of physical assets and critical financial information in banks and business organizations. Moreover, access control systems provide a safer environment to individuals working in various organizations. According to 6Wresearch, Saudi Arabia access control market is forecast to grow at CAGR of 10.14% during 2015-21. Saudi Arabia has witnessed major infrastructure development over the last decade and multi-billion dollar infrastructure projects are lined up to be completed by 2024. Increasing construction activities in the Kingdom are boosting the demand for access control systems. Some of the key players in Saudi Arabia's access control market include- Lenel, Honeywell, Bosch Security Systems, and Siemens. Biometric access control systems are anticipated to be the fastest growing segment in the Saudi Arabia's Access control market by 2021. Biometric systems are mostly found in high end organizations. High cost has restricted the expected growth of this segment over the years. However, with gradual fall in prices, the market is expected to grow at significant pace over the coming years. The report thoroughly covers the access control market by types, by verticals, and by regions. The report provides the unbiased and detailed analysis of the on-going trends, opportunities/high growth areas, market drivers, which would help the stakeholders to decide and align their market strategies according to the current and future market dynamics. •	Historical data of Global Access Control Market for the Period 2010-2014. •	Market Size & Forecast of Global Access Control Market until 2021. •	Historical data of Saudi Arabia Access Control Market Revenue for the Period 2010-2014. •	Market Size & Forecast of Saudi Arabia Access Control Market Revenue until 2021. •	Historical data of Saudi Arabia Card Reader Access Control Market Revenue for the Period 2010-2014. •	Market Size & Forecast of Saudi Arabia Card Reader Access Control Market Revenue until 2021. •	Historical data of Saudi Arabia Biometric Access Control Market Revenue for the Period 2010-2014. •	Market Size & Forecast of Saudi Arabia Biometric Access Control Market Revenue until 2021. •	Historical data of Saudi Arabia Others (keypad, electronic lock, boom barrier) Access Control Market Revenue for the Period 2010-2014. •	Market Size & Forecast of Saudi Arabia Others (keypad, electronic lock, boom barrier) Access Control Market Revenue until 2021. •	Market Size & Forecast of Saudi Arabia Access Control Market by Verticals until 2021. 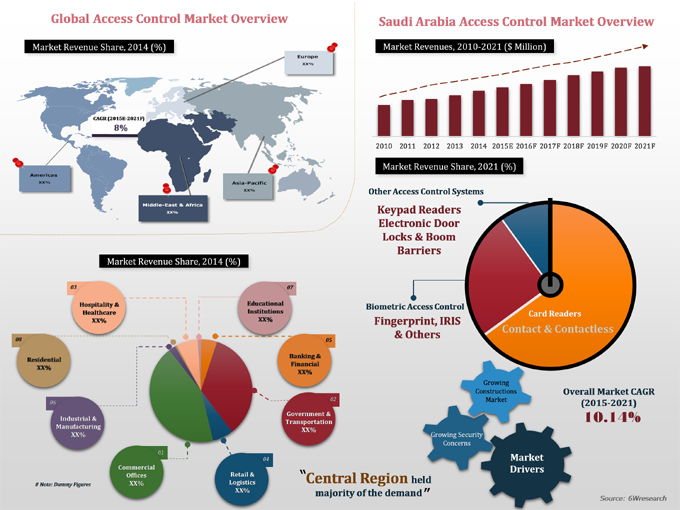 •	Market Size & Forecast of Saudi Arabia Access Control Market by Regions until 2021. •	Market and Price Trends. •	Major Players Market Share and Competitive Landscape. 13.1	Lenel Systems International, Inc.
Saudi Arabia access control market is poised to grow at a significant pace on account of growing security concerns, increasing IT spending, need to restrict unwanted access and expansion of public infrastructures. In Saudi Arabia, transportation, commercial offices and retail sector are the major demand drivers for access control systems. Card readers are the most common form of access control systems used in Saudi Arabia. In 2014, card reader access control systems accounted for major revenue share in the overall Saudi Arabia's access control market. Biometric access control system is the fastest growing segment in Saudi Arabia due to their higher accuracy and higher reliability over card reader access control system. Amongst all the biometric systems, fingerprint technology has captured the major market share. With improved technology and decline in prices, biometric system to prevail during forecast period. The major companies in Saudi Arabia access control market include- Lenel Systems, Honeywell, Bosch Security Systems, Siemens, Samsung Techwin, FingerTec and Tyco.